Though I’m now a benefit auctioneer in Virginia, my corporate past included working as an event planner. As part of that career, in March 2005, I was relieved to learn from the Convention Industry Council that I had passed its difficult CMP exam. They sent me a letter with an official sticker. Sweet. What is the Convention Industry Council®? An organization of national and international members who are involved in the meetings, conventions and exhibitions industry. (Think event planners, hotels, convention centers, caterers, production companies, and the like). The group has 103,500+ individuals and 17,000+ companies as members. And what does that mean? In layman’s terms, it means that if you work in the events industry and want to qualify for the CMP, you better be well-prepared to document all of your work experience, educational background, and extracurricular activities to prove that you live and breathe events. I assumed that with my on-the-job training and relative ease at taking tests, the test would be easy. After all, I was pretty much a straight-A student right through my Master’s degree. How difficult could this be? That test sent me running home with my tail between my legs. Admittedly, the CIC offers a number of CMP study groups to help event managers prepare for the comprehensive 4-hour test. But around the time I’d been approved to take the test, my life changed. Within a two-week period, I’d left Washington, DC to live in Florida for the winter. For the first time ever, I was living in a warm climate … in January. The idea of finding a CMP study group in Florida didn’t even cross my mind. I grabbed my textbook, headed to the beach, and (ah hem) prepared for my test. Two months later — with a lovely tan — I drove to Orlando to take the test. I wasn’t as prepared as I would have liked, but I’d read most of the book. By the time I left the classroom, my eyes were glassy and I was stunned into submission by the test’s difficulty. I wasn’t alone. As I left the building, groups of students were commiserating in the parking garage. “I studied 6 months and feel like it was a waste,” said one. As for me, I was reminiscing about bok choy and if it was the right vegetable to serve with chicken. 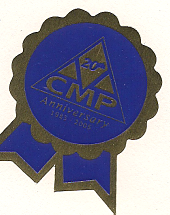 But every five years a CMP must re-certify. Next year is my big CMP recertification year. Lovely. The CIC gods will review my immediate 5-year history to see if I am still deemed worthy of the letters. To boost my own re-certification points, from 8:00 AM to 4:30 PM tomorrow, I’ll be volunteering to grade (or, “review” as the CIC politely says) some of the CMP applications from the 600-800 people who pay a $225 fee to apply for the test. Statistically, I believe about 30% of those applicants will be rejected. Some will appeal and a few will win. All qualified applicants then pay $450 to sit for the CMP exam. My CMP documentation folder from the past five years is fat with proof of my attendance at conferences, speaking engagements, and events (fundraising gala auctions, in my case). But I want to be sure I have some cushion on my application, just in case. So tomorrow I’ll be volunteering. I’ll let you know how it goes.